There’s nothing better than chit-chatting about everything and anything while having tea with a friend. I wish that I could tell you that I serve the tea in lovely tea cups . . .but, I don’t. We generally have tea (or coffee) at a nearby coffee shop. And, when I have friends over, I use mismatched, chipped mugs. Sometimes I miss the matched tea sets that were used a hundred years ago. Posted on October 8, 2015 October 7, 2015 by SherylPosted in OtherTagged tea sets. I don’t use tea sets either, just mugs. I do have a stoneware dinner set that comes with mugs those I use for entertaining, at least they all match. I have a dinner set with cups and saucers. I use the plates and bowls in the set–but I can’t remember the last time that I used the cups. For the last 15 or 20 years, no one ever wants coffee when I have people over for dinner in the evening. I have some fancy tea cups with matching saucers, but it seems I always save them for ‘special.’ I think it’s time to enjoy them! I agree-you should definitely use them. You could have a really fun tea party. I have some “special” dishes, as well as some linens, that I got as wedding gifts–and I finally realized that it made no sense to just keep them in closets and never used them. Make every day special by using them! 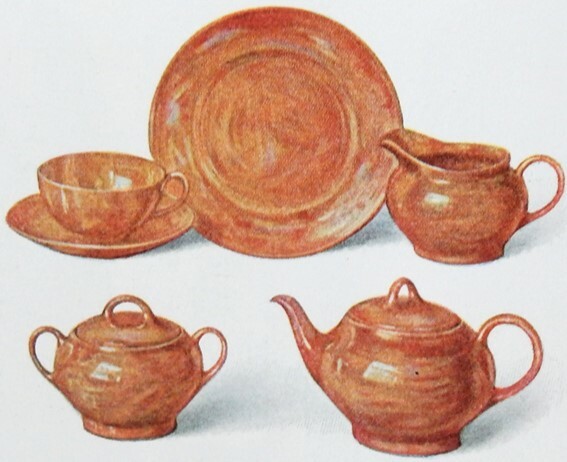 When I was buying and selling china — and collecting more than was necessary — I had some lovely sets. Now, I’m down to just one, although I have a few chocolate pots left. Looking at posts like this one is dangerous. It stirs those collecting urges again, and I need to be dispersing, not collecting! Chocolate pots? They sound like wonderful things to own. I just posted a photo of one of my favorite pots in response to Sheryl, Gallivanta. It’s a little wonky, as the pot is a bit taller and more slender than it appears, but you’ll get the point. Chocolate sets had a tall pitcher, and small cups and saucers. The cups were taller than demitasse. I just checked and found I do have a photo of one of my favorites that I still own — a hand-painted Limoges pot. Wow, it’s beautiful. It looks so elegant. I can see why you like it. Thanks for sharing the photo and for explaining what chocolate pots are. I’m going to have to look for them the next time I go to an antique shop or flea market. So beautiful. I am now convinced I need a chocolate pot. Thank you for posting your photo. I am glad you still own it. I just walked through the house and did a count — I have at least five. I think a post is necessary! They are. And you can find complete ones now and then that have creamers and sugars, too. I used to think all of those were coffee pots, because I’m not accustomed to cream and sugar with hot chocolate — but apparently that was the custom, especially in Europe. First, I love your fall photo. I have about 3 tea sets, but generally just grab a mug to fill with tea. I would like to go back to tea with friends. It’s nice to hear that you like the photo. It’s a photo of the farm house my grandmother lived in when she was a teen keeping the diary. I have photos of it for all seasons and thought that it might be fun to cycle through them for the header. Somehow pictures of that house symbolize the simpler times of a hundred years ago to me. We don’t have the beautiful PA colors here and I really enjoy looking at your photos. I also was surprised how plain they were–apparently it was the “new” style in 1915. It’s nice that you use your other cups and pots. I should have friends over for tea or coffee more than I do. Often I just make little ‘parties’ for myself. 🙂 Why not! I like it. Using nice cups and dishes can make an ordinary day seem special. I do have some matching tea cups and teapot but they rarely see the light of day. Like you I seem to meet friends at a coffee shop these days…although we do have a couple of delightful tea shoppes close by and each time I visit I notice how much better the tea tastes in a ‘real’ teacup! Almost all the tea I drink comes in paper cups. I wish that we had a tea shop near where I live. It sounds so much nicer. We only have mugs but most of them match. I think it would be lovely to have a tea set. When I was young I wasn’t interested in doing “fancy” entertaining. Now that I’m older, I think that it would be fun, but times have changed–and I continue to just do informal gatherings. I think you are right that fine entertaining is a dying art. . . sigh. . . These sets are beautiful! Our families are more coffee drinkers and I used to serve coffee in a cup and saucer. Now people seem to expect just a mug and are not sure what to do with a formal cup and saucer. Everything seems too casual but I do have some nice things that I can use. By the way, I really like your header photo with the fall colors! It’s nice to hear that you like the photo. It’s a photo of the farm house my grandmother lived in when she was keeping the diary. I decided that even though I’ve completed posting the diary, that I’d keep a header that provides a little continuity with the early years of this blog. I plan to use a different photo of the house for each of the four seasons. My friend had an English tea party in her small Brooklyn apartment about ten years ago–with a bone china tea set, crumpets and scones, and we all were asked to wear hats and gloves 🙂 It was great fun. I agree with Marcia here, if you have them, don’t wait for a special occasion! The tea party sounds absolutely wonderful. All of these comments are making me want to dig out my “special dishes” and invite my friends over for an elegant old-fashioned elegant dinner or tea. So many comments–you’ve tapped into something big here, Sheryl! It seems like the ritual of sitting down for coffee or tea has been lost, at least in my world. But I still love the look of the vintage sets! Yes, even though I’ve never served tea with a beautiful tea set, I feel a certain sadness that a lovely custom that once brought friends together has largely been lost. What a lovely, thoughtful gift from your friends. They must have known that you’d appreciate it. It’s so difficult to figure out how to balance preservation of vintage cups/plates/dishes with the enjoyment of using them. I wish I liked tea. I love tea cups and think the sets are so beautiful. I love old fashioned tea sets, there is a certain charm that I find really appealing. And yes, nothing is more comforting than sharing a lovely cup of tea with my husband, or a close friend! I agree – Tea (and tea sets) create a nice ambiance.